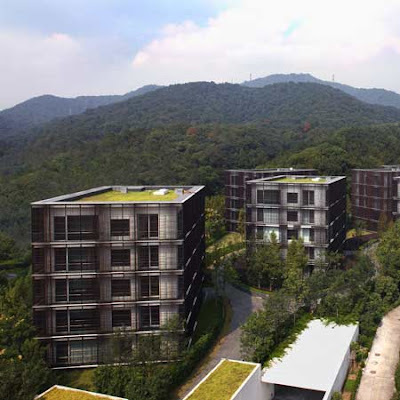 Some new additions to the long-running mash note... a couple of green rooftops on Ninetree Village via Dezeen, from David Chipperfield Architects, in Hangzhou, China. 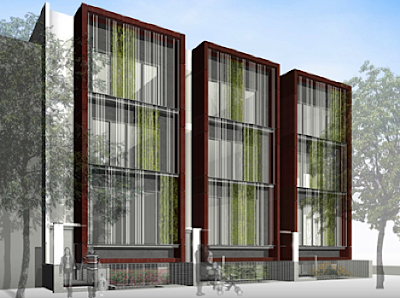 Jetson Green brings us some tasty vertical green panels on the Nzinga Town Homes, designed by Garrison Architects. 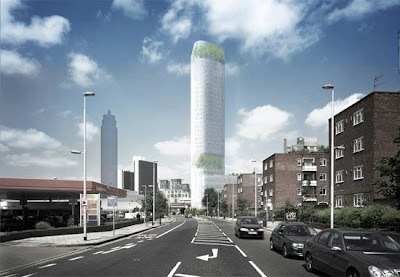 The Design Blog offers some great views of the Vauxhall Sky Garden in the United Kingdom. 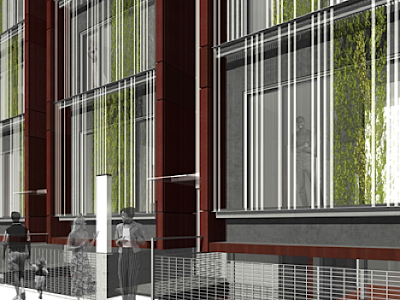 Aimed at high density living that encourages social interaction, the vegetation provides an antidote to proximity and urban ills. 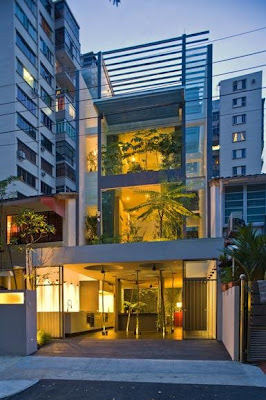 The Elok House by Chang Architects in Singapore (via World Architecture News) offers a variety of landscape types including living walls, and some unique multi-story trees winding through the spaces: "A rich array of garden types was arranged; a kitchen entrance grove of trees, a 2-storey internal enclosure of fern walls to the living spaces, moss pebble entrances to bedrooms. 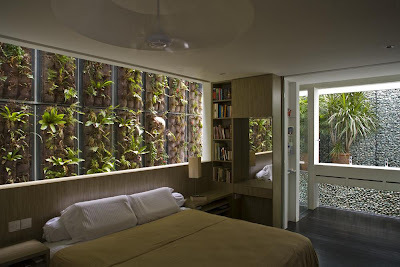 The design has a living, organic quality, where the plants grow and mature, where the smell of wet soil fills the air, where the leaves drop and wither in the house. 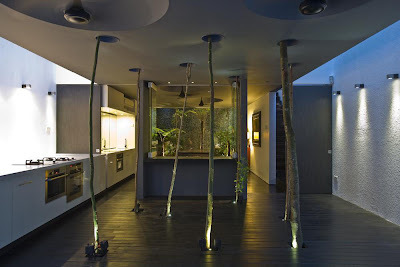 The configurations of the spaces and luxuriant use of plants and water elements generate a cool microclimate within the house, reducing the need for air-conditioning and artificial lighting. 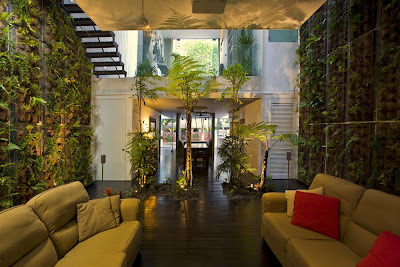 This house offers a congenial atmosphere, where residents can enjoy quality of its spaces and be in sync with nature." 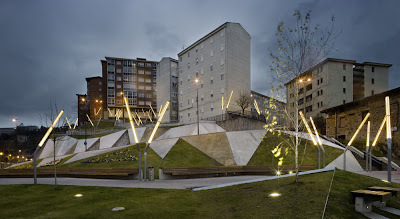 And a tag-team of posts from WAN and Arch Daily for the Galindez Slope and Pau Casals Square by ACXT in Bilbao, Spain. 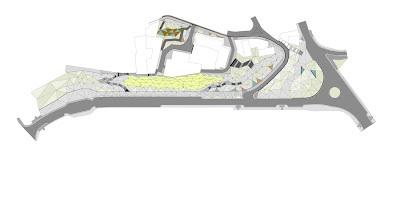 WAN mentions the landforms, with the designers: "...shaping the embankment by using inclined polygonal planes of different materials, such as the existing rock, various vegetation and concrete, to accentuate and complement the unique topography of the area"
And a plan a few more pics from Arch Daily. Hot. 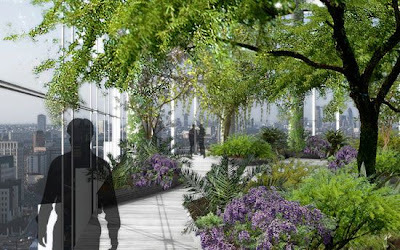 And for those jonesin' (or Jamesin' perhaps) check out 'Designing the High Line' - a new love note from Field Ops... I'm looking for a copy and will get a review in soon. Kisses. 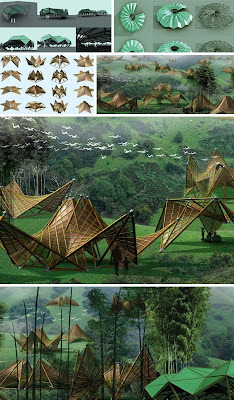 I love the Veg.itecture posts, and have been following them great deal lately. But I do have one critical note which I would like to share. It's all lovely and such to see all these great looking project renderings with their juicy splashes of green stuff, but then... well... you know you just realize that all your looking at is a nicely transparency texture map on a plan layered on top of, or hanging from, or even magically floating (CJ Kim)from a pretty building rendering. And even with the actual pictures of completed projects, my question is alway: How does that work out? Is it effective? Will it last? or did they just impregnate that moss with resin and stick it upside to that ceiling with Liquid Nails or VHB tape? As I'm aware you have a great deal of technical expertise in the implementation of Veg.itecture, perhaps you'd include some of that in your posts, or link to some things that might go into the feasibility of these ideas in more pragmatic detail. Apologizes for the bit of snarkiness, but I think some critical thinking about these issues in sorely needed. As an architecture student at a school that prides itself on "sustainability" I find that sometimes that just means a green marker overly applied to a plan, or some model railroad green fluffy stuff glued to the roof of a model. Nico. 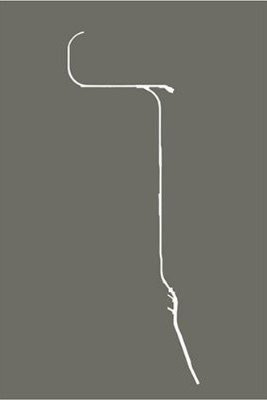 I am in complete agreement with you on the practicality and longevity of the solutions presented in the Veg.itecture series. 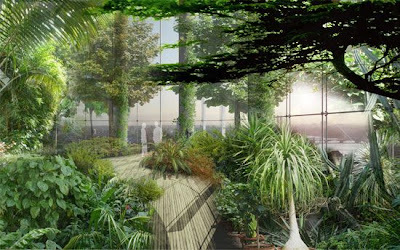 I've commented in the past about representation, where designers seem to be using vegetation as an inert 'green' material... with little or no thought to how it is applied. 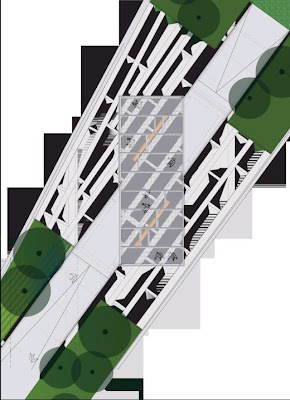 Even one of my favorites, Ken Yeang, has a bunch of zoomy renderings and not a whole lot of built work to examine... which seems the exception, not the rule. It wasn't until some of the newer built projects appeared that we even gave a thought to the reality that was possible... Quai Branly was a watershed moment... it was possible, and beautiful. The work of Blanc, and a bunch of built projects - although we don't know how they will fare into the future - at least give us some reference point of what's plausible. I agree more of the critical evaluation of these proposals is necessary - thus turning them into a tool rather than a insipid mash note about a design phenomenon. On one hand, I really want to push the boundaries about the potential of these uses - while still grounding them in first reality and second function. 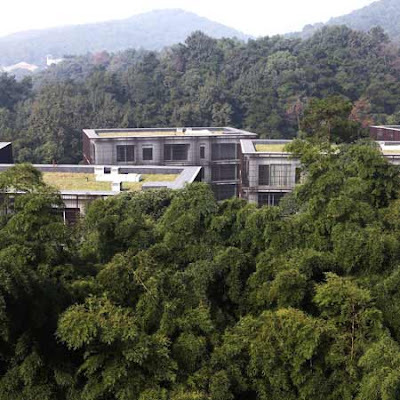 There's a need to level the playing field and opportunity between architecture and landscape. On the other hand, I'm very skeptical of the reality of these projects both as envisioned, initially planted, and long term. Time will tell - and experience and knowledge will allow us to improve. Rather than 'photoshopped-on' greenery (or marker or green fluffy stuff)... these need to work, and need to work within the framework of building systems and integrated design - not just an aesthetic add-on that may or may not work.